On a Friday afternoon in Berlin, Germany, I stood in a movie theater-sized room about to speak to hundreds of people on behalf of one of the biggest tech companies in the world. As fragments of my speech swirled through my head, I reminded myself to breathe and enjoy the moment. This talk wasn’t my first foray into public speaking, but as I stood there with the thought of representing all of Facebook Design, I felt a strong sense of responsibility. I successfully delivered my talk and soon the MOBX Mobile UX Summit came to a close. As I began the long journey back to San Francisco, I couldn’t help but reflect on my approach to public speaking. What could others learn from my experience? The resulting takeaways can help you tackle new speaking challenges, even when the challenge is representing something bigger than yourself, like your company. I began taking notes on design topics I wanted to hear more about while attending talks and conferences. As I became more comfortable with the idea of giving a keynote speech, these notes became an inspiration of sorts: a wishful backlog of topics for my own future speech. Taking steps toward my goal even before I was scheduled to speak anywhere helped me feel confident that I’d be ready when the opportunity came about. Keeping a list helps me actively think about what might be missing from design community conversations, what I would like to see, and, ultimately, what I would personally like to share with people. When considering topics, I focus not only on what I want to hear about, but also on what I can use from my own experience. At Facebook, I design for people whose life experiences are different than my own: people dealing with low connectivity, data usage constraints, and less powerful devices. I’ve had to develop a framework for incorporating empathy throughout my design process. This experience shaped the topic of designing for emerging markets and developed from a simple note on my laptop to a presentation at MOBX. Another source of topic ideas stems from conversations about the company. From family to peers I meet at conferences, people are curious about what happens inside Facebook. Family and friends often want to know what it’s “really like” to work at a big tech company like Facebook. Peers are often curious about our approach to design and learnings they may bring into their own practices. I know I can help answer these questions and be an ambassador to Facebook’s open culture. What design processes are unique to your company? What interesting projects have you been working on lately? You may just be the expert on a topic people want to learn more about. After accepting the invitation to speak at MOBX, I asked myself a couple of times “what did I just get myself into?” I felt a lot of pressure to deliver a great presentation. What if nobody cared about my topic? What if I didn’t do my message justice? What if people didn’t learn anything new? Sometimes it’s better to jump at opportunities and ask questions later, lest the opportunity falls away from your fingers by the time you thoroughly assess the situation. I consider any second-guessing normal and part of the process. I feel the fear, and then I move on. After all, I’m the only one who can share my own experiences and personal learnings. If I don’t share these stories, then who will? More important than my feelings is the urgency of the message I want to share, and so I focus on the message. No matter who you are or where you work, your experiences are uniquely yours. Sharing them is going to be valuable to someone else because they won’t have your same perspective or knowledge. Sharing my experiences designing for people in emerging markets is important to me because I grew up in Peru going to internet cafés and using a typewriter to write my school essays. At first, I was a little hesitant to share my story with people. Why would anyone care about my personal story? Why not only focus on my design process or the product? I followed my predisposition to focus on facts alone. But, as I shared my slides with peers, it felt like something was missing. The “something” missing was me. My work and my learnings all go through the filter of my background and past experiences. Without acknowledging my story and the role it plays in my design process, I’m ignoring a crucial element in arriving at my design solutions. I’m preventing people from truly getting to know me and how my story informs my design process. By sharing who you are as a person, you uncover an important layer in who you are as a designer. Sharing this with people helps them better connect with you and your work. When you’ve been hard at work for a long time, it’s easy to keep going without taking a moment to truly be present. 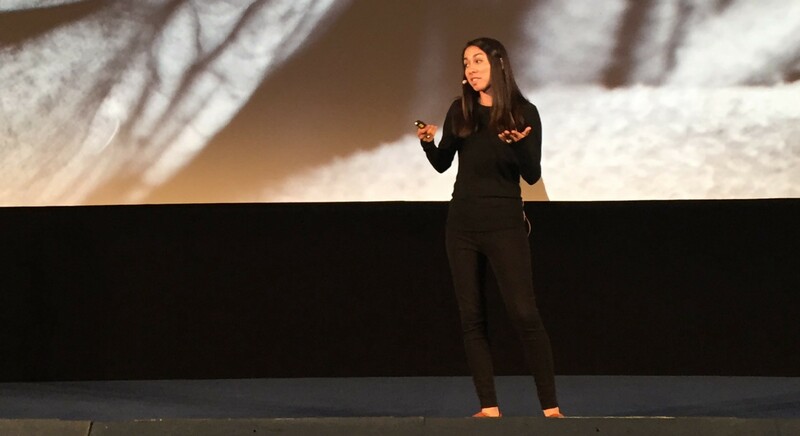 At MOBX, as I saw my presentation projected on a giant screen, I reminded myself on why I love public speaking: the power to connect with people and empower them to create. Whatever your reason for public speaking and whether you are representing yourself or your company, remember to embrace new challenges and enjoy the experience as only you can share your own story. Thanks to Tanner Christensen, Jasmine Friedl, and Jonathon Colman.